Feedbacks are categorized into topics. It is mandatory that each feedback belongs to a topic. Everyone who has Gtmhub account can create feedback topics. 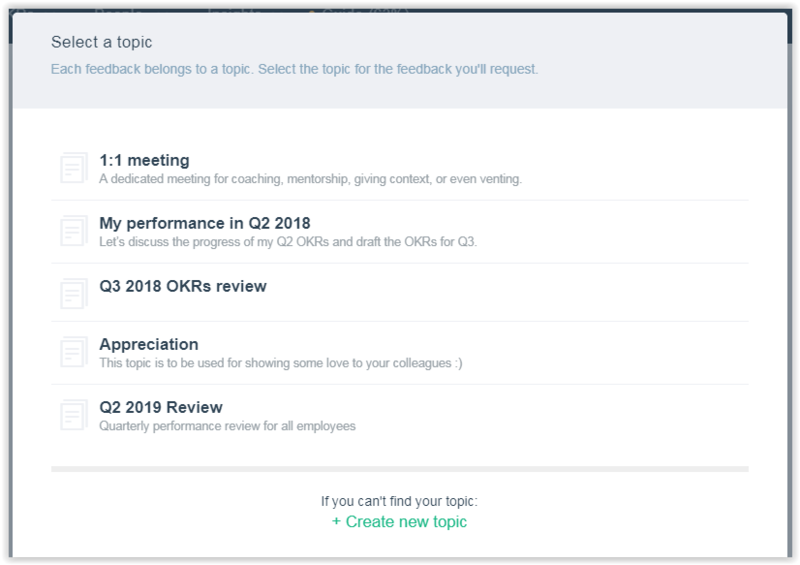 To create a new feedback topic just hit the Create new topic button. Give the Topic a name. Provide a short Description, for example how people should use it. It will be send in the email with the feedback requests. 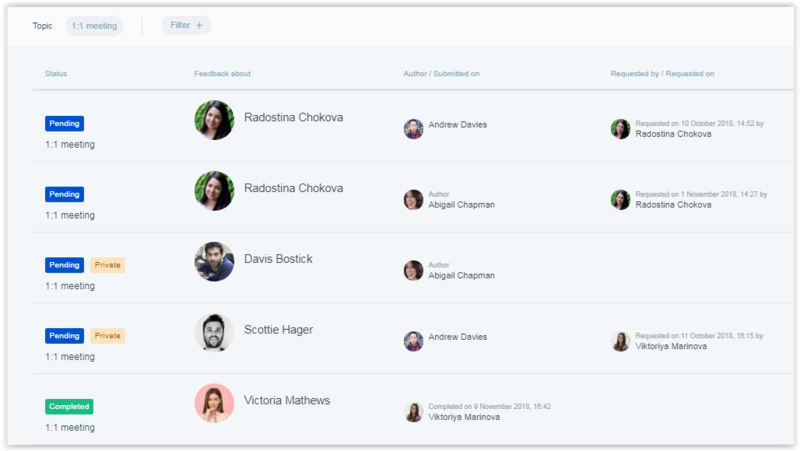 The Permissions section allows you to make the created feedback topic visible to everyone in the account - Public, or to only one or more users - Custom. Hit Create button at the bottom of the screen to save your new feedback topic. The topic will be now visible to all users that have access to it. If it is Public, it could be chosen by everyone. If it is Custom, only people that have been selected in the Permissions section will see it. This section on the left menu is visible only for admin and HCM roles. 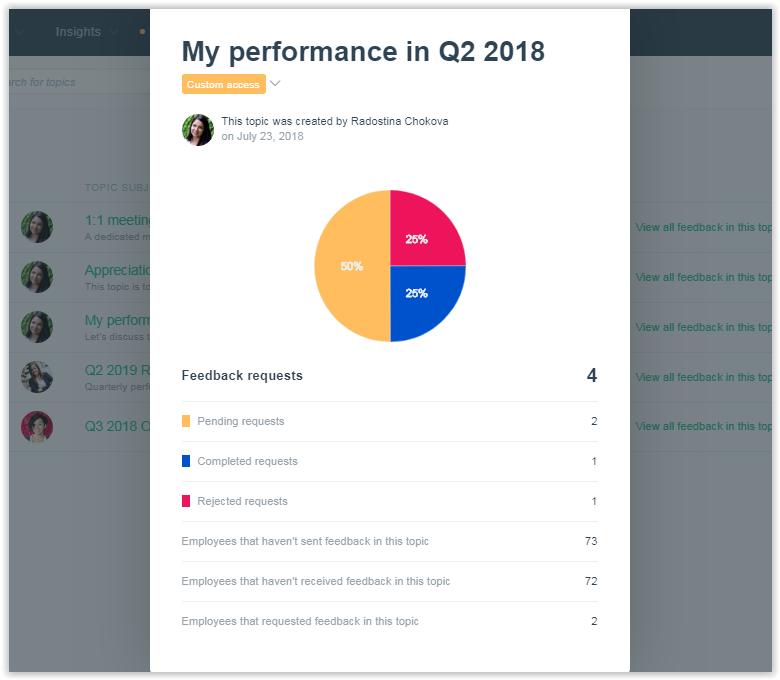 Here, as an admin or HCM, you can create topics and see all of the feedback that has been given on that topic. On this screen there is a list with all the topics that have been created in your account, who created them, their description and if they are custom or public. and who has requested the feedback. Statistics are also part of this section and gives a high level overview for admins and HCMs of how the topic is used. Click on the topic subject from the list with topics.